At Buckingham Coatings we understand the importance of ensuring your premises are protected against graffiti. In order to meet this requirement, we provide a dedicated service which is completed to our trademark high standard and available in competitively priced packages. What is an Anti-Graffiti Coating? A coating of this type has been specifically designed to prevent any graffiti paint that is applied from bonding to the surface. It differs from other paint types because if graffiti is applied to the surface the coating is easily able to stand up to the required cleaning process. Other coating types are often damaged or destroyed as a result of these cleaning processes. 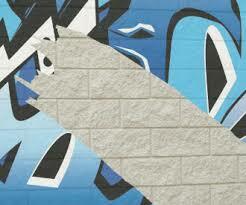 We offer two types of anti-graffiti coatings – (i) sacrificial coatings and (ii) permanent coatings. This coating type is a clear coat barrier that is applied to the wall or surface that is to be protected. Should the surface fall victim to graffiti then the coating can be removed, or sacrificed, using a high-pressure washer removing the graffiti with it. Subsequently, a new coating must be applied. This coating type is in most cases substantially more expensive than a sacrificial coating. However, if correctly applied, only a single coating will be required. This coating works as it creates a protective surface which spray paint is unable to bond to. If the surface is vandalised, all that is required to remove the paint is a simple solvent. The graffiti will then be removed, leaving both the underlying surface and the protective coating undamaged. We are not only able to provide a dedicated anti-graffiti protective coating service; we can also carry out graffiti removal projects. Once we have removed graffiti, we will then use one of the above methods to recoat the surface, ensuring ongoing protection is provided. Please note, our graffiti removal service utilises water jetting and specialist cleaning chemicals. Buckingham Coatings have performed graffiti removal and the application of anti-graffiti coatings on a wide variety of both commercial and public buildings. This includes sectors as diverse as supermarkets, car parks, retail outlets and even listed buildings. For further information or to arrange a survey of your premises to determine the scope of work, contact us on: 01908 765 009.